Specifications, Images, links, videos, comments and more information can always be found through our database on the Dell Venue 11 Pro information page. A full gallery of our images can be found here. 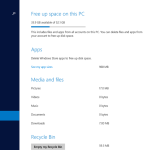 We have a new 64GB model here which comes with 2GB RAM, 32-bit Windows 8 Pro with the recent Windows 8.1 Update. We’ve also got the Dell Tablet Keyboard with integrated 30Wh battery. 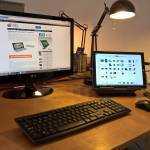 Display: 10.8 inch 1920×1080 with Pen and 10-point capacitive touch. Battery capacity (measured by Windows powercfg:) 30Wh on tablet, 26Wh in Keyboard dock. Ports: Tablet: Micro USB, Mini HDMI, Micro SD, USB3.0 (full size), headset, docking. Keyboard: MicroUSB charging. Charger: MicroUSB, 5V, 2A out. Accelerometer, rotate lock, TPM module, NFC, 8Mp cam rear. 2Mp cam front. Note: No GPS. Pen not included. In the box you’ll find the charger and charger cable. There’s no Office Home and Student license installed on our review device but we understand that this is delivered with the device (model 5130) in the USA. You’ll have to check locally for other regions. Dell Venue 11 Pro unboxing and overview video. We’re focusing on the Venue 11 Pro tablet in this section of the review and what a slick looking tablet it is. It’s got the same all-black screen as the Venue 8 Pro and the rear is rubberized but it’s not imprinted with a pattern as on the VP8. It feels solid which is a good thing but it feels a little heavier than most tablets. At 730 grams it’s over 100 grams heavier than the Lenovo Miix 2 10 and 150 grams heavier than last years Acer W510. Why? Take a look at the back and you’ll see why. 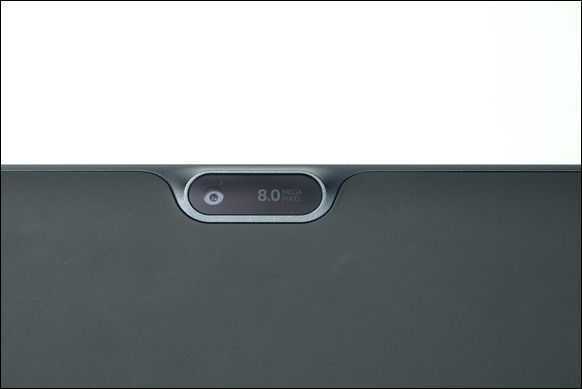 That panel is removable and reveals a replaceable battery. The addition engineering and cell protection required for removable batteries is a 100 gram penalty. Remember that you’ve got a 10.8-inch screen here with a digitizer layer too. There’s a full-size USB3.0 port, a pin-removable MicroSD tray which keeps the smooth looks (and might even offer a bit of extra security against MicroSD card theft) dual-array mics, a Kensington lock (again, security), microUSB charging port (which means you can connect a USB3.0 docking station and charge at the same time) and a Mini (not micro) HDMI port. A full gallery of our images can be found here. Fit and finish of the plastics around the device is very good although removal of the rear panel is not something you should note be doing too often in our opinion. Camera 8MP auto-focus rear camera and 2MP front camera. Array Mics and Stereo Speakers. USB3.0 port. The full-size port improves the ability to connect peripherals. 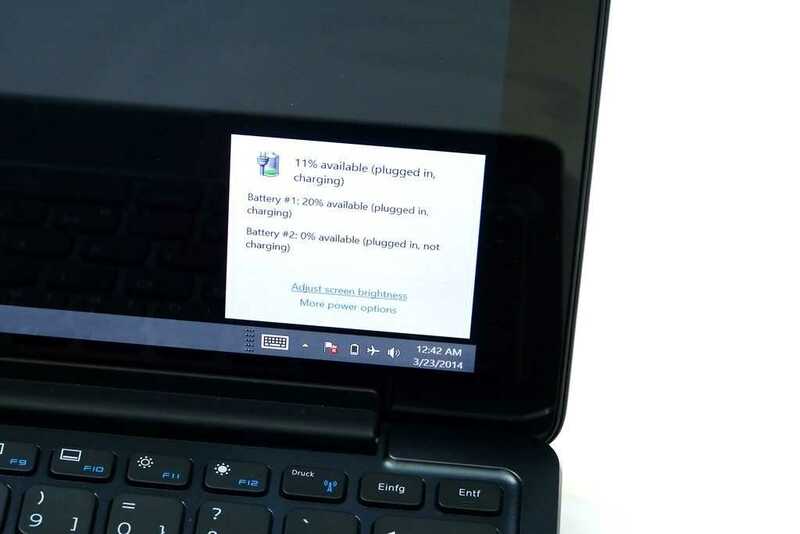 We could not charge a Windows 8 tablet via this port but we could charge a Nokia Lumia 920, even in InstantGo mode. We suspect 500mA output on the USB3.0 port. Two keyboard solutions exist as accessories. We’re testing the powered keyboard option below. Specifications, Images, links, videos, comments and more information can always be found through our database on the Dell Venue 11 Pro information page. From the very top layer we have an anti-fingerprint coating, glass, a digitizer layer, a capacitive layer and then over 2 million high-contrast, wide viewing angle pixels backlit with a strong source. In short, it’s excellent and in our opinion the colors are better than on the best-in-class for the 8-inch category – the Dell Venue 8 Pro. Dell have tuned the Window and font sizes a little too large in our opinion but after we had re-tuned it via the Appearance and Personalization settings, we were much happier. Viewing angles are excellent on the Dell Venue 11 Pro screen and it makes us long for a full-size SD card slot as this would make a great photographers preview screen. You can’t ignore it; This tablet weighs 760 grams /1.67 pounds and is not the sort of thing that feels comfortable after you’ve been handling a recent Android tablet or any sort of 8-inch tablet. In reality it’s 20% heavier than a consumer tablet should be in 2014 and it’s a trade-off you’ll have to think about carefully because there are also a lot of positive things to say about it. We’ve already mentioned the screen quality but the processing power you’ve got is also significant. We’ll go into more detail later in the review but in terms of performance-per-gram the Dell Venue 11 Pro with the Z3770 must be up there with the best. 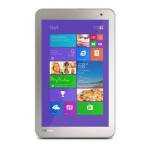 It’s certainly one of the most powerful fanless tablets you can get for the weight. You’ve also got a USB3.0 port on board (yes it will charge a phone, but not most tablets.) mini-HDMI and the microSDXC card slot. Great speakers and the 8MP auto-focus camera add to the package. 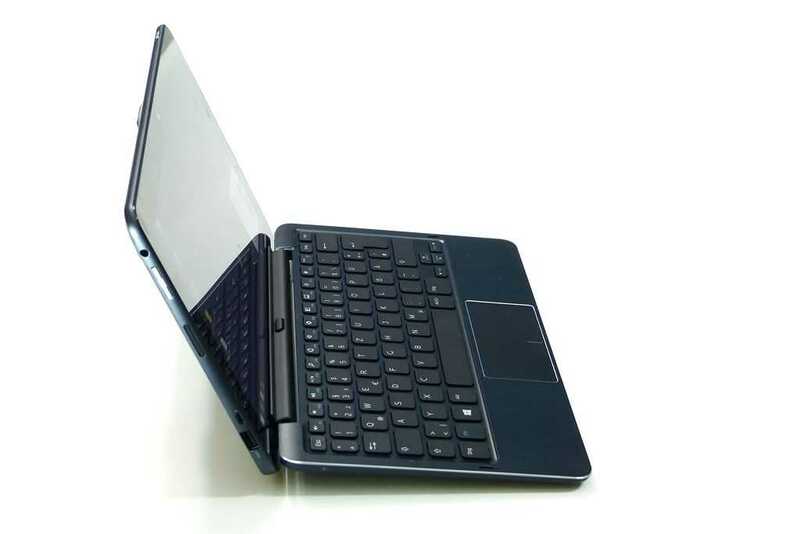 Given that the tablet is a little heavier than it should be, why didn’t Dell provide a kickstand? 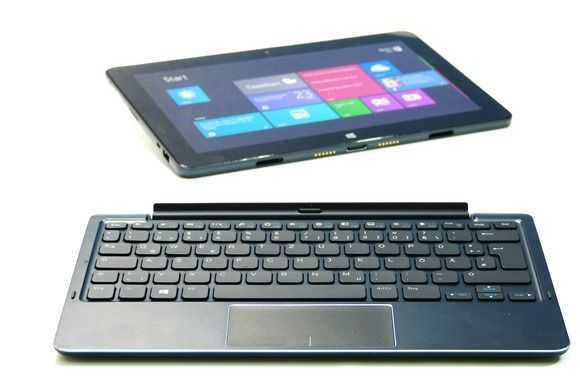 This is a set-up that the Dell Venue 11 Pro is perfect for as a video playback devices or ‘PC’ with a bluetooth keyboard and mouse setup. Another quick work on performance here; The Baytrail Z3770 platform is a little faster (by about 10% overall) than the Z3740 used on the smaller tablets and combined with the SSD (eMMC-based. Performance report below) it works really well. If only there had been 4GB RAM. 2GB just feels wrong on a tablet of this quality. We’re testing the Dell Venue 11 Pro with the recent Windows 8.1 Pro update and everything is working smoothly. The Modern UI is smooth, games work well within that space and there’s even little to complain about on the desktop side of things. Attaching the V11P to a Belkin USB3.0 display dock gave us a smooth, usable experience under browsing, writing and photo-management conditions and shows the difference a USB3.0 port can make when using a Displaylink type USB adaptor. 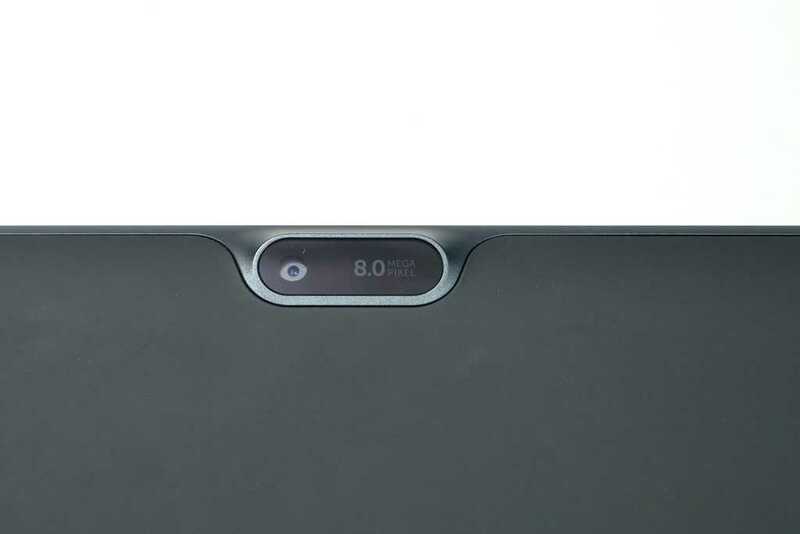 The rear 8MP camera is of good enough quality to be used to take pictures of documents or business cards that can then be converted into text using character recognition software. It’s also good for snapshots but given the size and weight of the tablet we don’t expect many people to be doing that. The front camera is good enough for 720p video conferencing. Audio quality on videos is not high quality but there’s a dual-array mic which is going to help provide better background noise limiting while conferencing. 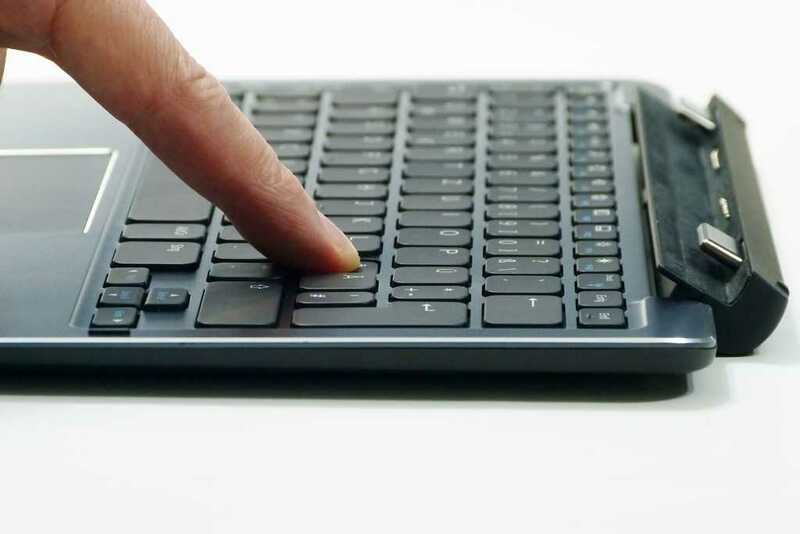 The Dell Tablet Keyboard – Mobile is a 700 gram (measured weight) dockable unit that not only contains the keyboard and mouse but also contains a 24Wh (reported capacity) battery. It is not back-lit. There’s a micro USB charging port but no data ports. A battery charging light shines on charging through either direct charging or via the tablet but only after the tablet battery has been fully charged first. 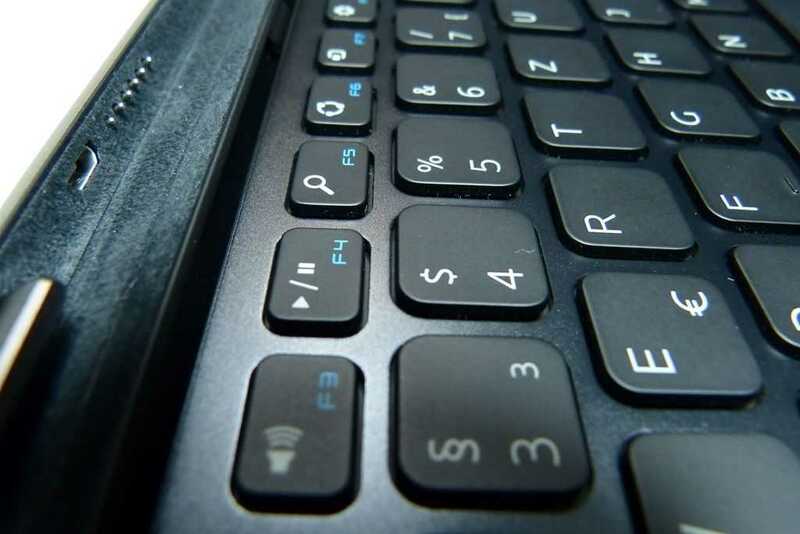 Functions keys are usefully reversed to provide Windows 8 volume, search, share, left-swipe, rights swipe, bottom swipe and menu, brightness and print rather than the default function-keys. 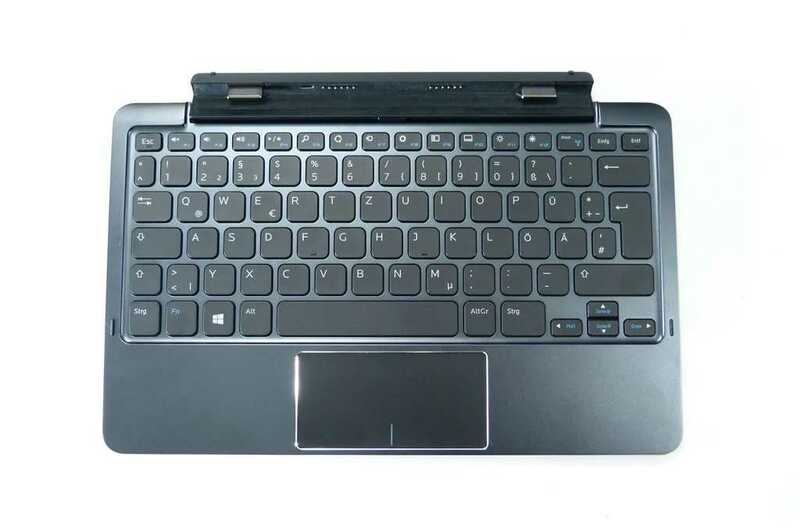 The strongly built unit has well constructed keys that feel good for typing and we felt confident enough with the keyboard to use it as the main keyboard and mouse when in extended screen mode with the external screen ‘stacked’ above the tablet screen. The unit supplies power to the tablet via a docking connector and the battery appears as a second battery in the power meter. The keyboard battery is charged when the tablet battery charge reaches a level of about 80% in order to provide the fastest possible tablet charging and to preserve the tablet battery life by not charging it in the stressful last 20% of its design capacity. The keyboard battery is used in preference to the tablet battery if it’s available. Are the slow SD card speeds of these Bay Trail devices a limitation of Bay Trail or the OEM’s implementation? I know the Bay Trail versions of Dell Venue Pros have a max 25 MB/s internal bus speed for the SD cards. The Core versions have a 104 MB/s limit. That’s not standards compliant. That’s pretty bad. I even complain when USB 2.0 ports can’t provide more than the 500 mA spec limit becuase some devices don’t meet USB power standrds themselves. Do the charging preferences mentioned apply no matter if the charger is plugged into the keyboard or tablet? 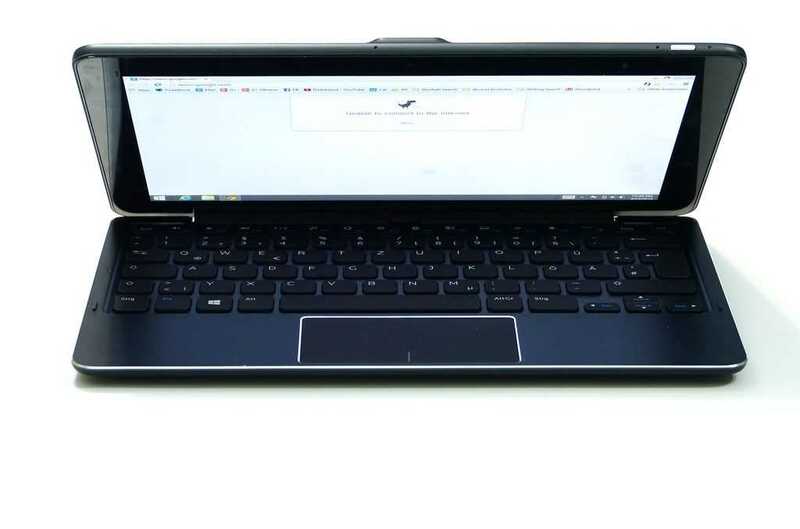 You mention that you can use two chargers to charge the keyboard and tablet simultaneously. Do they have to be separated or does this work when the tablet is docked? Are there user settable charge thresholds for the stop/start charging of the battery? Since I hear the digitizer isn’t very good even after the firmware/driver updates, can this be bought without a digitizer layer to save some bucks? 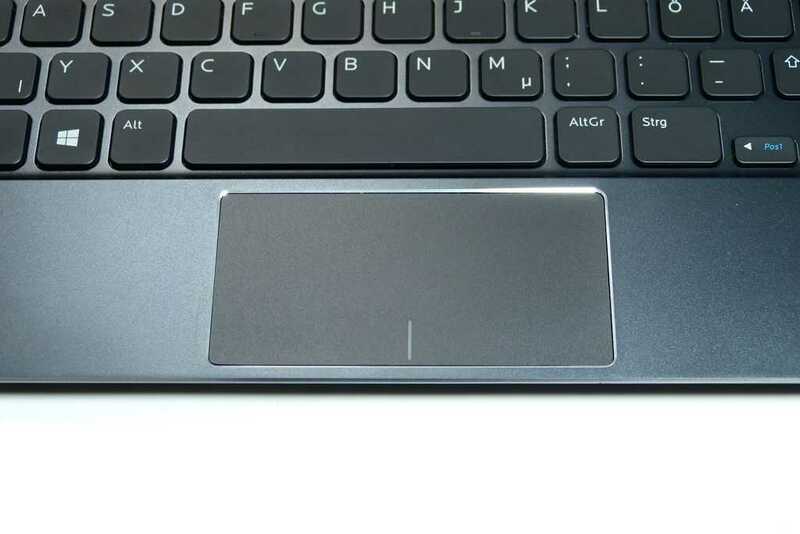 I looked at the pictures and it seems the microUSB port on the keyboard is where the dock plugs into. So I guess simultaneous charging can only be done when they’re separated because when docked, the keyboard’s microUSB port is blocked. Besides, this is a mobile device that’s optimized to maximize battery life and to operate under limited wattage to prevent the need for active cooling… So it’s not like the battery in this system could output that much power to begin with… Especially, when you’re basically asking for a higher output than the entire system runs on! I don’t think they should say it has USB 3.0 if it doesn’t meet the requirements. Maybe if there’s a small footnote somewhere about it on Dell’s page or manuals then that could be okay since it’s “disclosed”. Knowing beforehand could be enough for some users. Having the internal components of the sytem draw little power can mean that the battery and power regulators can provide more power to external devices. This isn’t using some single cell smartphone battery. I have a Clover Trail Dell Latitude 10 with only a USB 2.0 port and it can provide power to an external mechanical HDD that draws more than 1 A just fine. The only Clover Trail tablet I’ve heard that was actually limited to 500 mA on its USB 2.0 port was the ThinkPad Tablet 2. During my search for a Bay Trail tablet, several other Bay Trail 8″+ tablets can power non-USB 2.0 power compliant external HDDs using their microUSB 2.0 port fine as well. Based only on that quote, that sounds more like user error or incorrect expectations. He might have connected a Windows 8 tablet with a USB 2.0 microUSB port to the USB 3.0 port of the Dell. 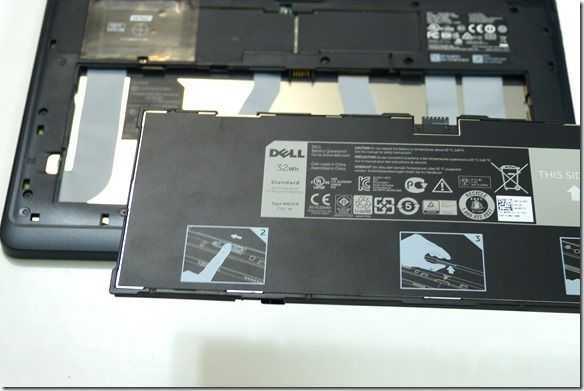 If the other tablet was standards compliant then it will only negotiate and draw 500 mA from the Dell which could be the case. From my experience, 500 mA will probably only have a positive net charge to the tablet when it’s off or in Connected Standby. If the Windows 8 tablet that was being charged from the Dell had a microUSB 3.0 port then it may likely negotiate and draw 900 mA from the Dell. Whether or not that’ll charge the other tablet while it’s screen is on depends on its system power draw though. I don’t think they should say it has USB 3.0 if it doesn’t meet the requirements. Maybe if there’s a small footnote somewhere about it on Dell’s page or manuals then that could be okay since it’s “disclosed”. Knowing beforehand could be enough for some users vs finding out when you’re out traveling. Having the internal components of the sytem draw little power can mean that the battery and power regulators can provide more power to external devices instead. This isn’t using some single cell smartphone battery. I have a Clover Trail Dell Latitude 10 with only a USB 2.0 port and it can provide power to an external mechanical HDD that draws more than 1 A just fine. The only Clover Trail tablet I’ve heard that was actually limited to 500 mA on its USB 2.0 port was the ThinkPad Tablet 2. During my search for a Bay Trail tablet, I found that several other Bay Trail 8″+ tablets can power non-USB 2.0 power compliant external HDDs using their microUSB 2.0 port fine as well. Based only on that quote, that sounds more like user error and he connected a Windows 8 tablet with a USB 2.0 microUSB port to the USB 3.0 port of the Dell. 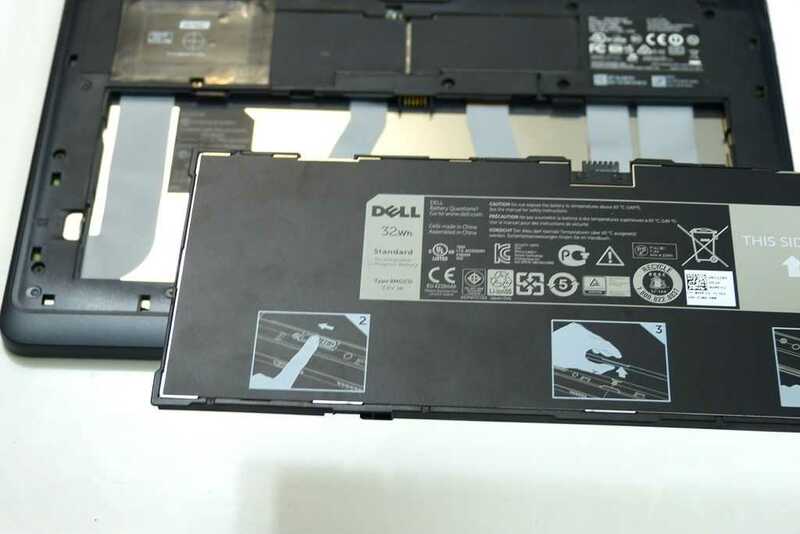 If the other tablet was standards compliant then it will only negotiate and draw 500 mA from the Dell which could be the case. From my experience, 500 mA will probably only have a positive net charge to the tablet when it’s off or in Connected Standby. If the Windows 8 tablet that was being charged from the Dell had a microUSB 3.0 port then it may likely negotiate and draw 900 mA from the Dell. Whether or not that’ll charge the other tablet while it’s screen is on depends on its system power draw. Getting 900 mA from a USB 3.0 port is a valid expectation. Being a mobile device doesn’t mean anything in terms of complying with minimum specs. There are other 8″ and 10″ Bay Trail tablets that can power spinning USB HDDs from their micro-USB ports. Many of them ignore the minimum power spec and draw far more than 500 mA. First, most USB HDD don’t require a lot of power to run… typically ranging between 1 to a little over 2 watts, maybe 2.4 watts. Second, most mobile devices don’t even have full size USB ports and usually provide 250mA or less! I’ll just post this once since I didn’t realize my last comments were waiting under moderation and double posted. I do have external HDDs that take more than 500 mA. It says so right on the hard drive. Just ask all those ThinkPad Tablet 2 users who encountered several external HDDs and optical drives that didn’t work on the tablet due to the 500 mA limit. There’s a very long thread on their support forum about it. I never heard of this or are you lumping in smartphones in there. I haven’t seen many smartphones actually advertise OTG capability so not providing 500 mA is fully expected for a non-advertised feature. Many reviews and user experiences I’ve read about other Bay Trail (both microUSB OTG and full-size USB) and Clover Trail (full-size USB) tablets can power external HDDs (mentioned above) just fine. Some users also used the same HDDs that didn’t work on the TPT2. The charger doesn’t have much to do with the output of the USB port. I’ve had notebooks (ie. ThinkPads) that can charge slower, not charge or even discharge under heavy use unless you opted to buy the more expensive higher wattage chargers yet the USB ports still provided more than 500 mA under battery only use. USB power output has to do with the battery and the power regulators not the charger. Having the tablet still slowly discharge or not charge when powering external devices is definitely more preferably than a non-compliant USB 3.0 port. What’s the hub got to do with it? A hub will share the data bus but, as mentioned above, the power supply is determined by the battery and related power circuits. Besides, it’s the only USB 3.0 port on the Dell. The tablet was just an example from the article. There other USB devices that can use more than 500 mA which have already been discussed. The main point here is that advertising USB 3.0 means it complies with USB 3.0 specs unless otherwise noted by Dell. If they can’t make it comply then they should go back and redesign the powering scheme or not even provide the port. Having a partially compliant device will definitely cause me to be suspect of the device’s quality as a whole. I know Dell wouldn’t be the first to release non-conforming hardware but I stay away from those as well. @tik What HDD indicates is just max but it only draw the max under certain conditions… but normal operations usually requires much less! Besides, there are drives that can draw up to 1.1A and that’s higher than even USB 3.0 supports! And again, we’re not even talking about high powered laptop or desktop systems but very low powered mobile tablets with SoCs designed to operate below 5W… They don’t provide 10 hours or more run time because they have great batteries but because the system is very low powered… Many have less than the equivalent of a 3 cell battery on a laptop! 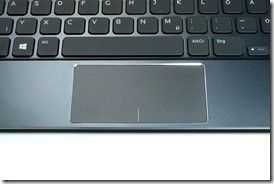 Question about docking the tablet to the keyboard in reverse. I assume the 2 outer lugs are just for securing the the tablet and keyboard together and the inner pins are what provide the data and power connection. When inserted in reverse, do the pins make contact with the tablet connections? 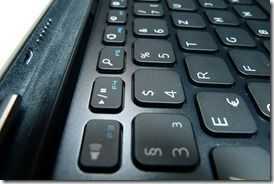 If so, are the pins internally disabled on both the tablet and keyboard? I wouldn’t want power connecting to ground and other dangerous connections. Is this docking orientation officially mentioned in Dell’s documents? No, the tablet just sits on the locating lugs. This isn’t officialy mentioned; It’s just something that was suggested to me as a test. It’s a ‘holder’ scenario. Can you wave your arms and make a quick comment comparing the keyboard experience between the Dell Venue 11 Pro and the HP ElitePad 1000 G2 with Productivity Jacket? I’m sure I’ve seen you say both are very good. Can you pick one over the other? If so, why? I want a 10″ very-good-typing portable; don’t care especially about tablet mode, but do want 1920×1200 (Dell sacrifices this), light weight, and long duration. Getting impatient (rumors of ThinkPad 10 notwithstanding). That’s a really good question. My instant answer would be that the Dell is better but I haven’t had the Elitepad for long-term testing. 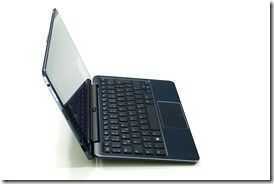 For me, the most sensible solution would be the Elitepad 1000 with keyboard jacket. I like the lighter weight of the Elitepad 1000 G2 tablet. Price needs to be considered. This is a decent tablet for me. But I would really love to pay $150 more and get a Haswell CPU, 4GB RAM and slimmer and lighter built. Does the tablet’s camera support auto focus? 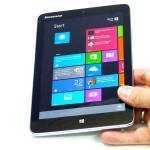 Chipy my question is sill unanswered regarding dell venue pro 8 . Can it be recovered from USB drive. Excellent review. Quick question though – will that Bay Trail handle Adobe InDesign/Dreamveaver projects? Not that I want to start any project directly on it, but I’d like to have the option of reopening any existing project and customize text/code occasionally. Another thing – is it really worth paying extra for the i3/i5 version if I’d like to use it mostly for casual business purposes? By that I mean using MS Office and a lot of pretty big pdf files and internet browsing. What do you think about the performance per dollar ratio in that case? I know that 4GB of RAM instead of 2GB makes a significant difference, but is the difference THAT significant when it comes to CPU efficiency? The SSD size is completely irrelevant in my case – I’m going to put a 128GB+ microSDXC card in it anyway. I’ve just realised that since the CS6 release Adobe software runs only in 64bit environment so you can ignore my previous question. 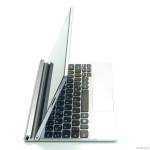 However I’d like to ask another one – how’s the device temperature and noise in the i3 and i5 versions? I’ve heard that it can get pretty warm and considerably noisy. Is that true? If so then is it tolerable or rather irritating? « Off-the-grid entertainment with DVB-T on a Windows 8 Tablet.